Double grand prix winner Daniel Ricciardo reckons Red Bull stablemate Carlos Sainz Jr would benefit from making his Formula 1 debut with a backmarker team. Sainz has held talks with Caterham since the squad's takeover by a group of Middle Eastern and Swiss investors advised by ex-HRT boss Colin Kolles, though Red Bull has told the Spaniard to focus on winning Formula Renault 3.5 this season. Red Bull ace Ricciardo made his F1 debut with HRT in 2011, before stepping up to Red Bull's Toro Rosso squad in 2012, and the Australian said he benefited from an introductory part-season with a small team. "I think it helps in a lot of ways," Ricciardo said. "It helped me get into F1, settle down with all the nerves, not really in a spotlight, so it eased me into the sport a little bit. "It also makes you more grateful for what you have. "When I signed for Toro Rosso I was the happiest man in the world knowing that I could maybe fight for points. "You really work hard for those extra last little bits. "Signing for Red Bull made me more grateful to get the better things so I am sure we will see it with other drivers coming through. 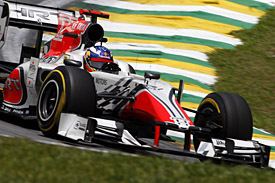 "Jules [Bianchi] is obviously doing really well at Marussia, there is talk [about Sainz]. "It didn't harm me. As a driver you want to be in the best team as soon as possible, but it definitely helped me learn in the right way." 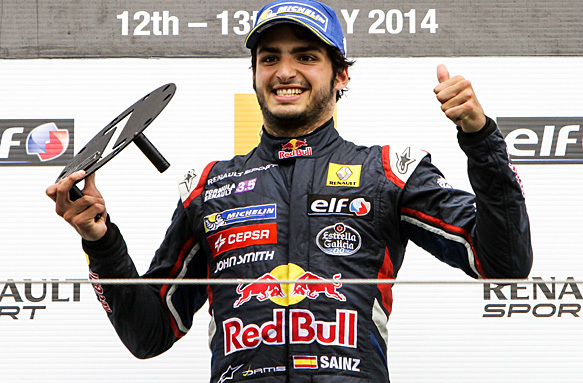 Sainz told AUTOSPORT last month that any F1 experience "is going to be a good thing" but that his priority for this year is to become the first Red Bull driver to win the FR3.5 title.